Not everyone has the budget to buy a high-end laptop with all the latest bells and whistles. For such users, who want a functional laptop for home or school use but don’t want to go broke buying it, Acer has released Acer Aspire E1-510P-2671. With premium features like Windows 8.1, a touch screen and a slim design, it comes with a price tag of less than $500 which is more than half of what most new high-end systems sell for. It is a budget-friendly laptop for those who don’t want to spend an arm and a leg to get a high-end system. Just like every other budget-price laptop, Acer Aspire E1-510P-2671 also comes with a boring design and plastic construction. It comes in clarinet black color, which is identical to normal black, but with matte finish. Body is made of good quality plastic and feels sturdy and stable while using, but at times users might feel some flexing. For a 15-inch laptop Acer Aspire E1-510P-2671 is not so heavy and weighs only 5.85 pounds. It comes with a slimmer profile than most budget-price laptops, it is just 1.05 inches thick, with overall dimensions of 1.05 x 15 x 10.1 inches (H x W x D). Even with such a thin profile, it still comes with a tray-loading optical drive (DVD+-RW dual-layer). It comes with several ports on both sides, on right side along with the optical drive, it comes with two USB 2.0 ports and a connector for charging, on the left side, there is one USB 3.0 port, Gigabit Ethernet port, headset jack, HDMI-out and VGA-out. On the front side, there is a SD card slot and a Kensington lock. The Kensington lock allows the user to physically secure the laptop when using in public places. Acer Aspire E1-510P-2671 comes equipped with a 15.6-inch touch screen display. Like most budget laptops, it has a native resolution of 1366 x 768 pixels. The joints that support the screen are sturdy but often the users might end up readjusting the screen, as the joints don’t hold up well against taps and swipes on touch screen. Below the display, there is a full-sized Chiclet style keyboard with numeric keypad. 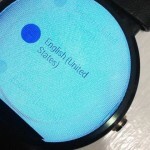 The buttons are properly placed for comfortable use and provide good tactile feedback when pressed. A minor issue with keyboard is that Acer has combined the enter key and the key above it to form an old fashioned L-shape key and the arrow and function keys are smaller than the rest of the keys. Below the keyboard, there is a large multi-touch trackpad with separate left and right mouse buttons though both buttons are also combined. The trackpad also offers gesture support. To our surprise, Acer has filled the laptop with lots of bloatware and preinstalled apps. 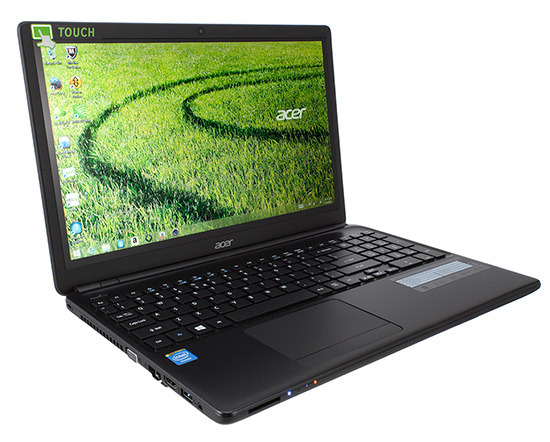 Acer Aspire E1-510P-2671 comes with proprietary programs like Acer Scrapboard, Acer Docs and Acer Remote Files. Scrapboard allows users to organize photos and clippings, while Acer Docs and Acer Remote Files are file syncing and sharing programs. It also comes with a one month trial of McAfee LiveSafe Security and Microsoft Office 365. That’s not all, it also comes with several pre-installed apps like Evernote, StumbleUpon, Spotify, Music Maker Jam, Netflix and Hulu Plus. It also has several apps for eBooks and news including Kindle Reader, Zinio Reader, Next Issue and NewsXpresso. Users have the option to remove most of these apps. Acer Aspire E1-510P-2671 comes with one year limited warranty. Acer Aspire E1-510P-2671 is a budget laptop and like most budget laptops, it comes with very cheap components. It comes equipped with a 1.86GHz Intel Celeron N2920 dual-core processor with Intel HD Graphics and 8GB of memory. For storage it has a 500GB 5400rpm hard disk and for wireless connectivity it has Bluetooth 4.0 and 802.11n Wi-Fi. The processor has nothing impressive to write about, but is good for general users who type some documents and do light internet surfing. With the hardware it comes equipped with there is not much to test, but during some performance test it offered middle of the road performance. In PCMark 7 test it scored 1,585 points which is better than its rivals like HP 2000 2b19wm or Toshiba Satellite C855D-S5104 which scored 1,087 and 1343 respectively. Though it couldn’t stay close to the cheaper Dell Inspiron 15 L15RV-6190 BLK which managed to score 2,117 points. During different multimedia tests Acer Aspire E1-510P-2671 offered better performance than both HP and Toshiba laptops. It completed the Handbrake test in just 2 minutes and 43 seconds but took 16 minutes and 36 seconds to complete Photoshop CS6 test. No other Budget-price laptop offers such performance and Acer Aspire E1-510P-2671 can be used for light photo and video editing. It also offers the best battery life in its price range and lasted 6 hours and 4 minutes with a four-cell bnattery during the battery test, while Toshiba only managed 5 hours and 2 minutes during the same test. When buying a new laptop, if you are on a tight budget, there are not many options to choose from. Though Acer Aspire E1-510P-2671 with its 15.6-inch touch screen and slim design, is one of the better options in the low price category. Even though the Dell Inspiron 15 (I15RV-6190BLK) has better performance in some tests but due to its lower price and overall better performance Acer Aspire E1-510P-2671 is the best choice in this category.